Scott Doffek's UW-Milwaukee team set out on a long road trip to start the 2017 season. Essentially, they headed south, according to Fox6Now. "Getting in some good climates, getting our feet underneath us a little bit, and getting a sweat going, like baseball should be played, I think is important too," Doffek told the station. Doffek knew some about playing baseball in good climates - and elsewhere. He played as a pro over five seasons. He made it to AA, but didn't make it to the bigs. He then went on to a post-playing career as a coach, leading his players to all climates over two decades at UW-Milwaukee. Doffek's career began in 1989, signed by the Dodgers as an undrafted free agent out of Waukesha County Technical College. He started in the rookie Gulf Coast League. The infielder hit .281 over 41 games. 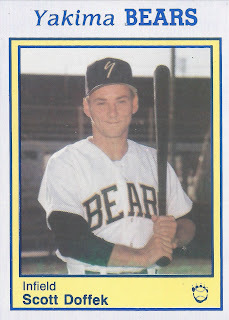 He then moved to short-season Yakima for 1990. He went 2 for 4 in two August games against Bend, scoring and knocking in a run in one. He hit .257 in 61 games overall. Doffek moved to high-A Vero Beach for 1991, then AA San Antonio in 1992. He knocked a single in a May game against Tulsa. He hit .288 on the year. He returned for one more campaign. In 26 games in 1993, he hit .259 to end his playing career. He arrived at UW-Milwaukee in 1996 as an assistant coach. He continued in that role until 2007, when he assumed the top position of head coach. He took over after longtime head coach Jerry Augustine stepped down. "Scott is one of the best baseball people that I know," Augustine told OnMilwaukee in September 1996 of his successor. "He deserves to have the program in a position where he can make all of the choices and it's actually `his' program." He talked in 2014 about working to get his players on to the pros. He saw three move on in 2012, according to Miller Park Prospects. He remains coach in 2017. "You're trying to put all of our guys in a position to get to the next level" Doffek told the site. "They all have a dream of doing that and when you see guys actually fulfilling that dream, that's attracted the recruits. And at the same time, I think it's a mark that we're doing a pretty good job of player development when they get here."